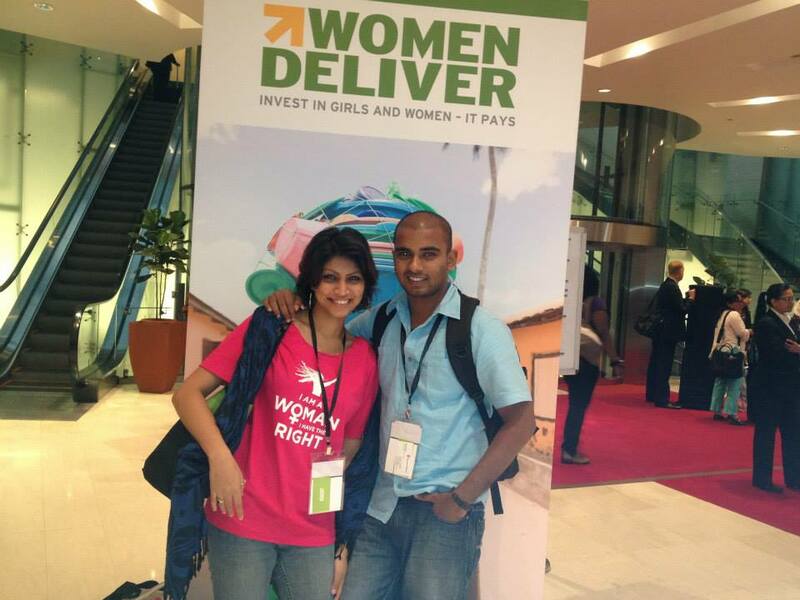 I was super excited to be a part of the largest global event of the decade to focus on the health and empowerment of girls and women- WOMEN DELIVER 2013! I felt equally excited when I touched down in Kuala Lumpur, Malaysia. I even had the pleasure of meeting a couple of famous Sri Lankan doctors and parliamentarians in the flight itself and this made me realise that this was a huge conference. As a young person I felt that we (young people) are important and was eager to see what other arrangements and great programmes we would have in the conference. Shared experience of country best practices from participants. Different perspectives of certain people on engaging men both positive and negative. I also attended a meeting where several advocates on safe abortions got together to plan their activities for September 28th, 2013 and to learn about what Asia Pacific Safe Abortion Partnership has been doing. Sri Lanka suggested a photography session on advocating for safe abortion where I and my fellow youth activists will be playing a major role. It was great to see so many discussions around claiming our rights to sexual and reproductive health, how political commitments to end AIDS can dive improvements in women’s sexual and reproductive health, what political commitments governments have and why they are not met. In conjunction with this we addressed peer education models in such settings and access to safe abortion care under the international human rights legal frame work. In Asia it’s very much about who we know when it comes to advocacy not what we do or what we know! Policy advocacy and budget advocacy, the importance of stressing the same message over and over, Vertical and horizontal progress of advocacy are a continual battle. In the conference they had ‘The cinema corner’ which was a room that screened inspiring films related to women and girls empowerment. It was great as many touching stories, projects and documentaries were shown giving us the movie atmosphere and the exhibition halls were amazing. Many booths had good information, innovative ideas, showcased their work and shared their best practices. Sadly, however the youth corner (a youth friendly space-zone) was not very vibrant and active and they didn’t have any cool activities for youth to be engaged in other than the daily meetings taken by the 100 young leaders. The youth corner was mostly deserted and no enthusiasm was shown. This could have been improved much and furthermore young people should have been part of the opening and closing panel discussions and ceremonies, this would have been super! Instead of tokenizing young people, we want our voices really heard this would have been more interesting to me personally. There were plenty of interesting important events and side events to attend and it was very difficult to choose which one to go to. It was too good and I just wish we had a better possibility of getting all the knowledge and expertise from different panelists and discussions. As a whole the experience I got and the friends I made were great! The final panel discussion was awesome. Kavita N. Ramdaas, Ford Foundation Representative and Global Fund Senior Advisor, Former President and Chief Executive Officer, of course you are inspiring! Thank you women deliver 2013!